Reviews of the Olympus E-P1 from around the web. Olympus announces a return to an old form factor, and the beginning of a new era of small, interchangeable-lens digital cameras. Panasonic shipped the first Micro Four Thirds cameras, but the Olympus E-P1 wins the prize for the smallest of the new breed of digital camera. The company is aligning the Olympus E-P1 with the old PEN system of film cameras, dating back to 1959, and the camera's style reflects that heritage. Looking only slightly like the original Micro Four Thirds concept design that Olympus floated last September at Photokina, the company's retro E-P1 with interchangeable lens debuts this year to ride the coat-tails of the 50th anniversary of the company's Pen film camera. From the name, to the design, to the tagline etched on its top -- 'Olympus Pen since 1959' -- it feels like both an homage and a desperate reminder that Olympus was in the camera business long before most digital photographers were born. 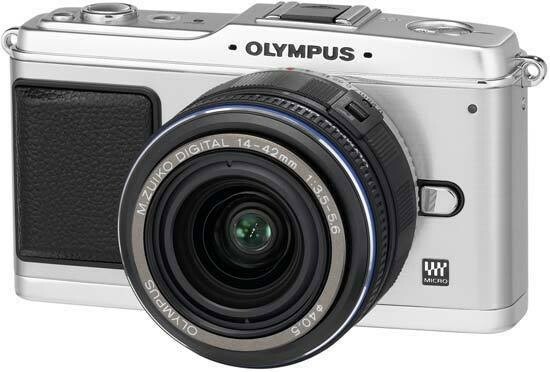 The Olympus E-P1 is an interchangeable lens digital camera. It uses a Four-Thirds sensor along with the Micro Four-Thirds lens mount. This is now the second such camera with a compact design similar to the reviewed Panasonic Lumix GF1.